A well presented traditional bay fronted detached family home; set within a popular location close to family friendly amenities. 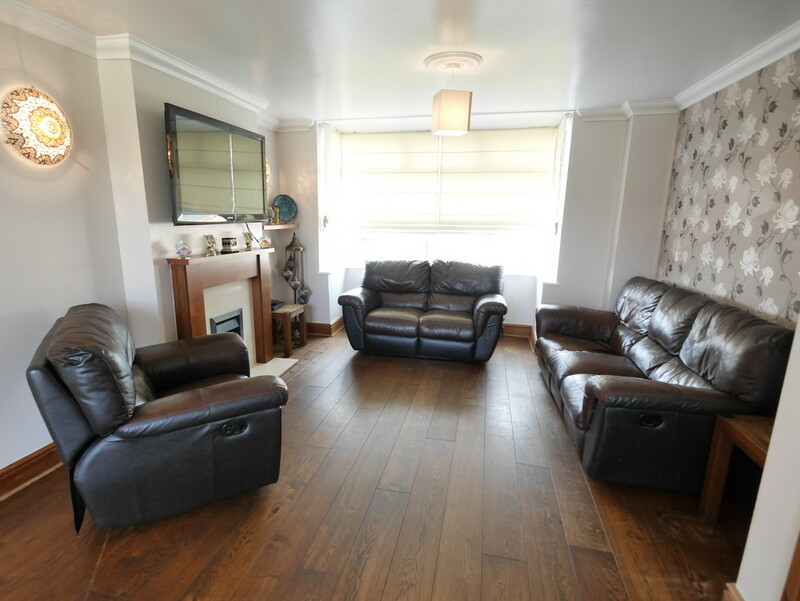 The property is double glazed and centrally heated and also has a driveway as well as further parking behind gates. To the rear is a good sized private garden. In brief the accommodation comprises entrance porch, reception hallway, lounge / dining room and fitted kitchen with useful lean to and WC to complete the ground floor. To the first floor there are three bedrooms, bathroom and WC. OPEN ENTRANCE PORCH Wall mounted light and wall mounted electric car charging unit. RECEPTION HALLWAY uPVC double glazed entrance door with side windows, radiator, laminate flooring and balustraded stairs to the first floor landing. LOUNGE DINING ROOM 25′ 1″ into bay x 10′ 10″ (7.66m x 3.31m) uPVC double glazed bay window to the front, laminate flooring, feature fireplace and hearth with inset coal effect gas fire, uPVC double glazed double doors out to the rear garden, two ceiling roses and coving. KITCHEN 8′ 9″ x 7′ 9″ (2.68m x 2.37m) Fitted with a range of wall and base cupboards with work surfaces over, space for a free standing cooker, plumbing for a washing machine, wall mounted Vaillant combi boiler, stainless steel sink unit and drainer, tiled floor, uPVC double glazed window to the rear and wooden door out to a covered lean too. 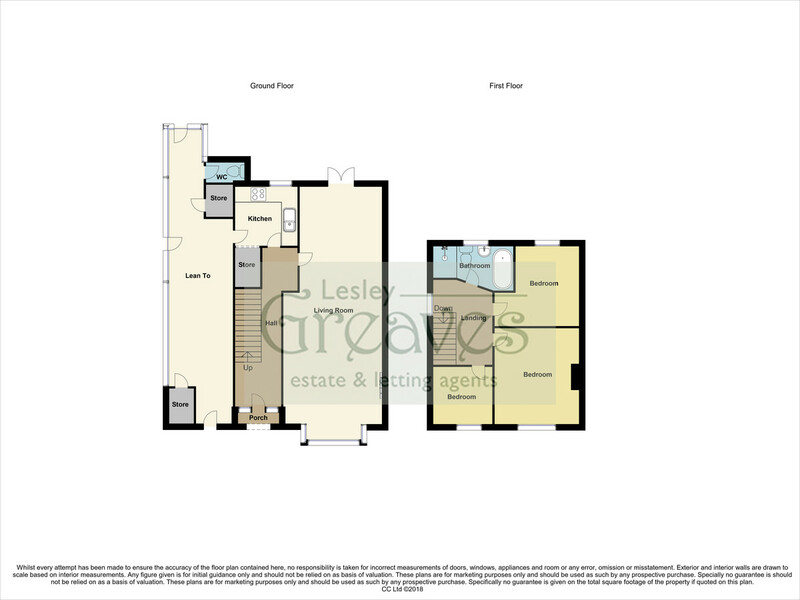 LEAN TOO Storage areas and a WC with a door to the front and rear garden. FIRST FLOOR LANDING Opaque uPVC double glazed window to the side and recessed lighting. BEDROOM ONE 12′ 7″ x 11′ 0″ into alcove (3.85m x 3.36m) uPVC double glazed window to the front and radiator. BEDROOM TWO 10′ 5″ x 8′ 4″ plus door recess (3.19m x 2.56m) uPVC double glazed window to the rear and radiator. BEDROOM THREE 8′ 2″ x 7′ 11″ (2.49m x 2.43m) uPVC double glazed window to the front and radiator. BATHROOM Fitted with a four piece suite in white comprising low flush WC, roll top bath with ball and claw feet and centrally mounted period style mixer taps, wash basin and walk in double shower cubicle, tiled walls, heated chrome towel rail, recessed lighting and opaque uPVC double glazed window to the rear. OUTSIDE To the front is a low maintenance garden and driveway with gated access to further parking. The rear garden is a very good size with a block paved patio, lawn and detached garage/outbuilding.